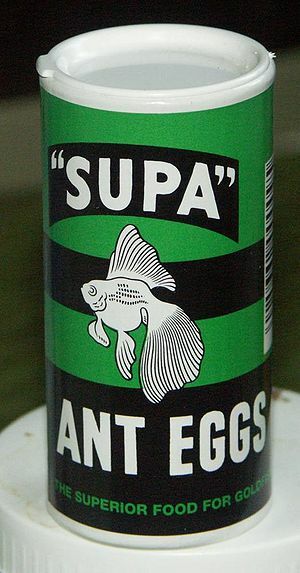 Ant eggs were one of the first traditional food sold for goldfish and tropical fish for many decades until surpassed by better foods. This food consists of mainly dried ant pupa (probably the common black garden ant, Lasius niger). The eggs are collected from ant nests and dried. This process also collects other items like dried ants, ant honey (the food fed to newly hatched ants) and various small pieces of dried plant stems, etc. Like all dried natural food it tends to float for a very long time and therefore is only suitable for surface feeders like goldfish and Mollies, Angelfish, etc. The typical egg is 5mm long and 3mm wide and so can only be taken by fish over 3" in length. It is best to prepare this food by soaking it in a small quantity of tank water for ten minutes beforehand to soften it, as otherwise the animals may try to take the hard dried food and reject it. This food isn't particularity high in protein and of course contains no vegetable protein. So isn't suitable for long term feeding to goldfish or other fish which require some plant matter in their food. This is a excellent food for Gouramis or other insect-eating fish if they are large enough to swallow the eggs. Typical collection of contents. Click on picture for a closer view. This page was last edited on 8 March 2011, at 04:16.